Top Franchises: Investing in Yum! Brands Inc. 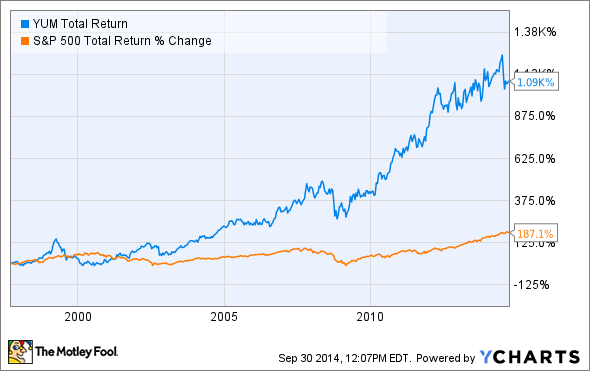 The parent company of Pizza Hut, KFC, and Taco Bell has performed well for investors so far. But is it a good buy today? Through franchising, established restaurant chains can quickly grow their footprint while at the same time limiting risk. While franchises may not be as profitable as corporate-owned locations, they can still be extremely lucrative for both the company and its investors. YUM Total Return Price data by YCharts. But despite its impressive rise, Yum! Brands could still be a bargain for investors today -- that is, assuming it manages to overcome some key obstacles. First, if its fellow fast-food peers weren't enough, Yum! Brands faces competition from rising fast-casual chains such as Chipotle Mexican Grill (NYSE:CMG). By serving comparably high-quality food in a timely fashion -- and at a slight price premium to chains like Yum! 's Taco Bell -- Chipotle has carved out an impressive niche by bridging the gap between fast-food chains and more expensive casual-dining restaurants. Still, Yum! has worked to combat consumers' perception of its "lower-quality" food, hiring celebrity chef Lorena Garcia in mid-2012 to craft its "Cantina" line of fresh, Chipotle-esque burritos and salads. Earlier this year, Yum! even announced a new fast-casual concept of its own to be named "U.S. Taco Co. and Urban Taproom" -- a decision the company says was made after a segmentation study discovered a large demographic unlikely to use fast-food restaurants at all. In essence, this meant Chipotle wasn't necessarily stealing huge market share, but rather that Taco Bell was missing this group of potential diners in the first place. Next, Yum! is also battling to repair its image in China, where August comparable-store sales plunged 13% after a local supplier was found to be improperly handling meat destined for a significant number of Yum! Brands' more than 6,000 Chinese KFC and Pizza Hut locations. Yum! Brands' KFC is struggling in China. Yum! wasn't the only one affected: McDonald's (NYSE:MCD) subsequently stated the same incident caused its August Asia-Pacific, Middle East, and Africa region comps to decline 14.5%. Both Yum! Brands and McDonald's have since suspended all business with the supplier, and Yum! has even voiced its intention to pursue legal action to reclaim damages. At the same time, Yum! Brands reminded investors that its business has shown resilience when faced with such incidents in the past. So, at least in theory, this time should be no different. But those past incidents happened only a short time ago. In fact, Yum! suffered through a similar ordeal with tainted chicken from another Chinese supplier in 2012, then extended its weakness in the nation last spring after unwarranted worries from an avian flu outbreak kept consumers away from its chicken-centric brands. By April of this year, it appeared China was no longer a problem for Yum! Brands as hungry consumers flocked back to its restaurants. For consumers, however, it's irrelevant that the blame technically sat with the suppliers and misunderstandings of avian flu. With each subsequent incident, it could arguably prove harder for Yum! Brands to bounce back. That said, with Yum! Brands stock 14% off its 52-week high and roughly flat over the past year, there are several reasons to believe today's shareholders could be handsomely rewarded with a little patience and a long-term mindset. Despite its weakness, Yum! Brands is still on pace to add another 700 new locations in China this year. That would bring its total restaurant count in the country to nearly 7,000, or just half its long-term goal of having "at least" 14,000 China locations. For perspective, McDonald's has about 14,000 locations in the U.S., the population of which represents a customer-base less than one-quarter the size of China's nearly 1.4 billion. Considering that China alone represented more than $1 billion of Yum! 's operating profit in 2012 (compared to "just" $777 million amid last year's weakness), Yum! should be poised to rebound in a big way when its China business finally takes an extended turn for the better. Yum! is also growing in other emerging markets. That most notably includes India, where it is adding more than 100 restaurants per year but still has only 714 locations serving a potential customer base of more than 1.25 billion. And let's not forget Yum! 's ambitious road map for nearly doubling U.S. Taco Bell sales to $14 billion by 2021. Much of that growth should come from focusing on new dayparts such as breakfast, which launched earlier this year, and the "afternoon snack," of which Taco Bell currently commands a tiny ~1% slice. Even if organic growth remains sluggish -- Taco Bell comps increased just 2% last quarter -- Yum! is growing Taco Bell's restaurant count by more than a third to 8,000, many of which will be located in smaller towns. Finally, for investors willing to endure some short-term volatility, Yum! also recently boosted its dividend by 11% to $0.41 per share, marking its 10th-consecutive year of double-digit payout increases. In the end, there's no shortage of opportunity for Yum! to not only improve its existing operations, but also to continue growing for the foreseeable future. All things considered, that's why I think Yum! Brands stock is definitely worth a deeper look.